Staging is an important, but often neglected, part of successfully selling your home. Small changes are enough to increase your sale price up to seven percent, so it’s worth putting in the effort to play up your home’s strong points. Bathrooms sell homes, and the staging strategy for your bathroom is simple, fortunately. Dirty, grimy bathrooms are a turn-off to buyers, so get rid of the surface mold and grime on the walls by using a mixture of one part water and one part bleach in a spray bottle. For your shower door, use a mixture of one part muriatic acid and 10 parts water, and scrub with steel wool. This will get your shower door clear and sparkling, which improves the overall look of your bathroom. If the tile is outdated, don’t spend the money to replace it. Paint the tile using a high-adhesion primer followed by a ceramic epoxy covering, which will give your bathroom a new, modern look for a fraction of the cost. Follow with a fresh coat of paint, and your bathroom will become a selling point for your home. Like bathrooms, kitchens can also make or break a home sale. Dated kitchen cabinets are an eyesore, but a coat of paint or stain is all it takes to modernize them. Top them off with some attractive hardware to create a kitchen that attracts buyers. Stainless-steel appliances are popular, but they can be expensive. Save yourself the money and hassle by resurfacing your old appliances with stainless-steel stick-on coverings for a modern look. Remove and clean the front panels, then apply the stainless-steel coverings for a brand-new look. If your appliances are really old, you may want to consider investing in new appliances for better returns. Granite countertops are another attractive, but expensive, addition to your kitchen. Ask for remnant pieces from previous projects to get low-cost granite, and do the work yourself to increase your kitchen’s value for less. Flooring is one of the first things a buyer notices, so you can’t afford to let damaged hardwood floors ruin the sale. Isolate the damaged boards and replace them with new pieces, sand the entire floor and stain the boards with a rich color to give them new life. If you have built-in shelves, you want them to stand out. Don’t let your personal clutter overwhelm the look. Keep the items sparse and neutral, so the buyer is more likely to notice the shelves on their own. Bedrooms should be clean and uncluttered. Remove anything you’re storing in the bedroom, clean up the unnecessary junk and keep the furniture minimal. If it looks like you need the extra space in the bedroom for storage, the buyer may assume they will not have adequate space for their needs. If you don’t have a headboard for your bed, add one. Headboards make the bed the focal point of the room and keep the look luxurious and elegant. You want the buyers to picture a space for sleep and relaxation. 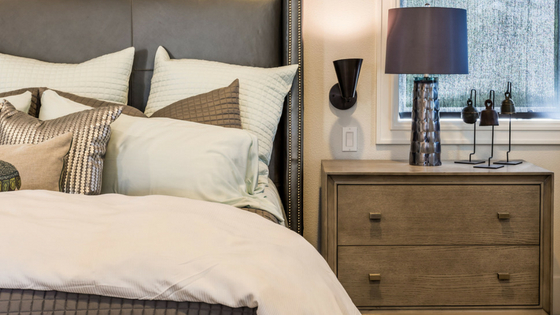 Coordinate your bedding and window treatments for an attractive, cohesive look. It doesn’t need to be designer-quality to be eye-catching, so just focus on coordinating the colors to get a high-end look for the whole room. Outdoor areas attract buyers to your home in the first place, so it’s best to maximize this advantage. Plant flowers, use stone sealant to clean up the walkway and put a faux finish on corner keystones to catch the attention of anyone walking or driving by. Decks are a nice addition to a home as well, but an older deck is a hassle and a liability. Put some work into restoring your deck to increase its appeal. Sand the wood and stain it with a light color to give it a rustic look, then pick up some coordinating outdoor furniture to create the perfect outdoor space for entertaining. Finally, refresh your front door with a coat of paint in a bold, cheery color, and add new hardware to the knocker, porch light, house numbers, lockset and mailbox. Put out some potted plants to finish this welcoming look. As you can see, a lot goes into wwweloping a staging strategy for every room in your house to make it more appealing to prospective buyers. If you want to get the most for your home, get professional staging advice from the experts at RE/MAX Northstar. This talented team of real estate agents knows what sells, so contact us today to see how we can help you!